Mensusa https://www.mensusa.com/articles/mens-black-sequin-blazer-attiring-for-the-fashionable-men.html Mens Black Sequin Blazer- A Classy Attiring For The Fashionable Men The mens black sequin blazer in combination with the appropriate shirt and tie set would enable you to make the most fashionable public appearance. The blazers are highly comfortable replacement to the traditional suit coats that enable you to retain the gravity on your appearance that is a usual feature of the suit coats. Hence, it can be said that the blazers are sophisticated, stylish and comfortable options to substitute the suit coats. The popularity of the blazers had paved the way for the addition of more fashionable options to the portfolio. 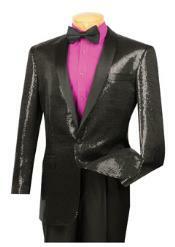 Of all the options, the mens black sequin blazer is the top choice of attiring for the fashionable. These blazers, when perfectly paired with the shirt and tie, can give an impressive appearance. The mens black sequin blazer had won the preference of the stylish shirt and tie with its strong fashion statement, sophisticated & elegant look and the suitability of the blazers as the attires across all sorts of events. Aside, the shade of black holds a legacy in men's fashion as the shade is among those options that men had been using since the conventional times. Another significant feature about the black shaded sequin blazer is that you can pair the jacket with all sorts of colors for the shirt and tie. You get the options to choose the light shades or the deep shaded ties as well as the shirts that make equally ravishing combination with the black sequin jacket. For instance, the combination between the burgundy dress shirt, black sequin jackets and tie in matching shades would project your fashion acumen and dressing sense in the most impressive style. The pairing between the the mens black sequin blazer with appropriate shirt and tie, you can be assured of getting a ravishing appearance. In case you prefer the lighter shades over the deeper ones or you need to make a soothing appearance to any morning events or may be to make a high-fashioned business dressing, the combination between the black shaded sequin jacket and the turquoise dress shirt would be an ideal choice. The color contrast between the black and turquoise would add glamour to your appearance in a style that projects a matured and classy taste. The combination of the mens black sequin blazer with the dresses shirts and tie is not only meant for a routine formal appearance or for the daily business dressing, but you can opt for the combination even while you dress for the special occasions, may be official or social. Pairing the shirt and tie perfectly with the black sequin blazer, you can certainly look for an appearance that look sleek, classy, elegant and purely in line with the contemporary fashion trends. With the blending of high fashion statement and optimal comfort, you can be assured that it would be convenient for you to carry the attires that would enable you to appear confident and in command of the situation. The portfolio of the black sequin jackets as well as the dress shirts and the ties, comprise enough of diversification to address your taste and preferences closely. These attires would enable you to uphold your fashion pursuits and fine dressing sense to the world in a style that would get noticed and surely appreciated. In short, it can be said that the collections would enable you to balance between the classic and trendy fashion orientations. Where to get the best collections at affordable pricing? After going through the points in the paragraphs above, it is obvious that you would start exploring about the sources to tap for getting these attires as well as you would wonder about the pricing of the attires. Good to say, you would be getting the availability of these attires at reasonable rates at the fashion retails online. The top fashion retailers like mensusa.com offers the most delightful collection on shirt and tie set, black sequin jackets as well as the dress shirts that would not only meet your expectations but the delightful prices would enable you to shop for these attires without having to shoulder extravagant expenses. The schemes like discounts, concessions and offers enable the buyers to shop more frequently and hence, it becomes easier for them to keep pace with the changes in the fashion trends.